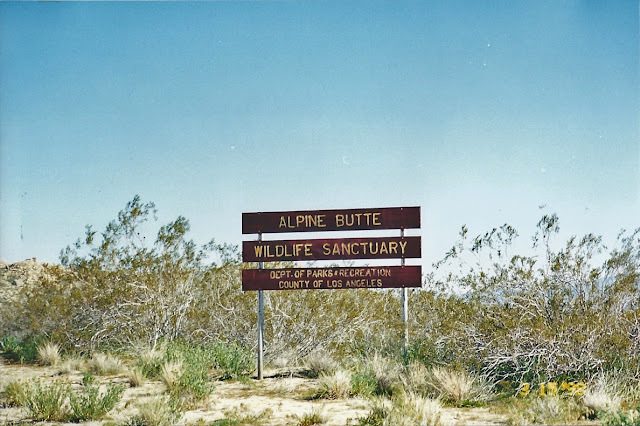 Alpine Butte Wildlife Sanctuary is located in the high desert (Antelope Valley) region of N. Los Angeles County - secluded, off the beaten track, with no established trails or facilities. The best time to come here, of course, would be during wildflower season (late winter-early spring), when human visitation would, I presume, be at its annual peak. 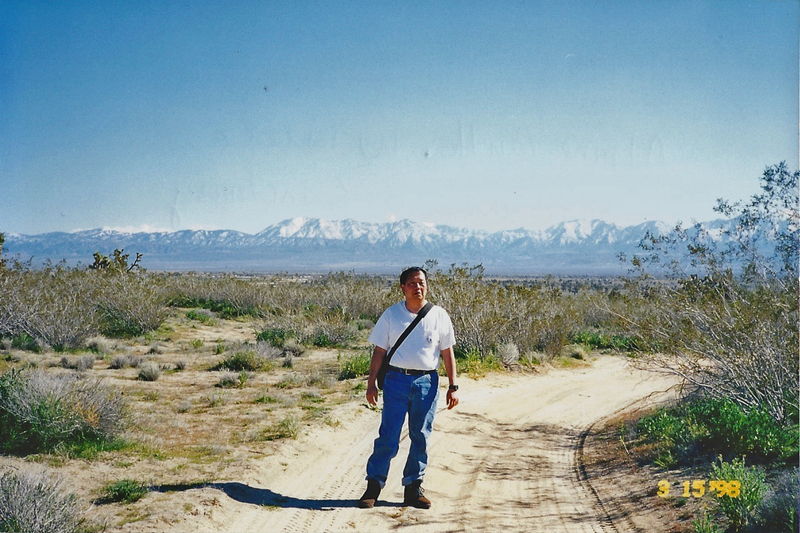 Our first and only visit to Alpine Butte was in March of 1998. Gil, my sis Elaine, her (now ex) husband Chuck and I had camped in Saddleback Butte the night before. On the way back to La Puente the next day, we split ways with EE and Chuck and happened on this preserve. In reviewing my field guides, this looked like a great spot for wildlife viewing, so we veered off road to check it out. Then, as luck would have it, just a short distance after we pulled off onto a dirt road from the sign on East Avenue "O," we got stuck in some soft, silty sand. Well, Shee-it. There was no other way to put it. This was deja vu all over for Gil and me from the last time we got stuck in desert sand (in the bimmer) on our side trip from Baker on Kelbaker Road to the Cinder Cones in the East Mojave in July of 1997 on our way to Las Vegas. That's a whole 'nother story for a whole 'nother post (http://westernsojourns.blogspot.com/2012/01/east-mojave-national-preserve-cinder.html)...Anyhoo, this time I had the brilliant idea to use the tarp in our camping gear and slide it underneath the rear tires, and we were able to back the car up over the tarp onto relatively solid ground. Whew! 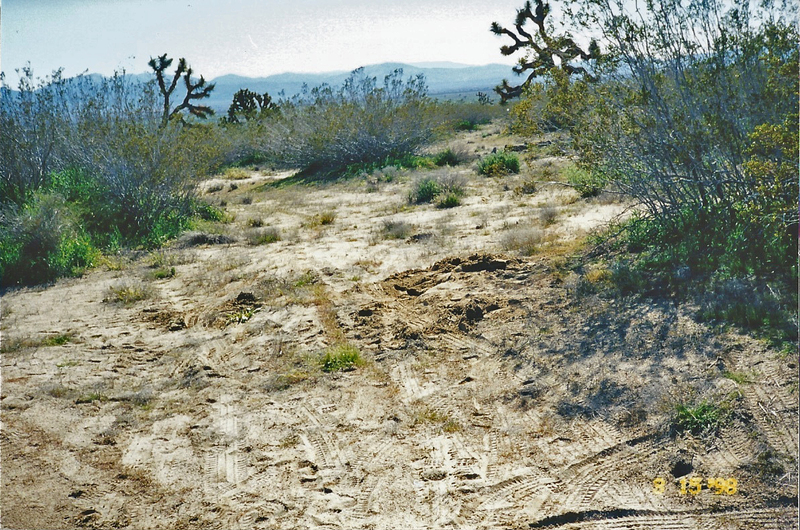 Believe you me, nothing is scarier than getting stuck in a less-traveled or off-season part of the desert. In the end, we didn't have the opportunity to do much exploring in this area due to our preoccupation with getting our vehicle unstuck. In hindsight, we should have just parked right off the road and ventured into the preserve on foot, which is what we'll do the next time we go out there. It's been well over a decade since our last visit, so we're well overdue for another one soon. 3/15/1998 Alpine Butte Wildlife Sanctuary, W. Mojave Desert, N. Los Angeles County, CA. Closest City/Town: Lake Los Angeles. Management: LA County Parks & Recreation. Directions: The sanctuary is located off of East Avenue "O", 1 mile west of 135th St. East (between 130th and 135th St., East), Lake Los Angeles, CA 93951. Road Conditions: The 'Avenues' and 'Streets' in this area are paved (generally 2-lane). As mentioned before, don't drive beyond the short stretch of graded dirt road into the preserve as your vehicle might get stuck, unless you have a tricked out 4WD. Pets: Pooches allowed. Just keep them leashed. Flora & Fauna: The dominant plant communities are Joshua Tree Woodland and Creosote Bush Scrub. For a list of the wildflowers, check out http://www.devils-punchbowl.com/pages/Alpine%20Butte.html .